Most of our articles are centered across ‘Trend Following’ and its variations. We strongly believe that Trend is the best friend of every trader and would continue to be the same down the line. This article would focus on the most versatile Trend strength indicator used by Technical analysts know as Average Directional Index (ADX). 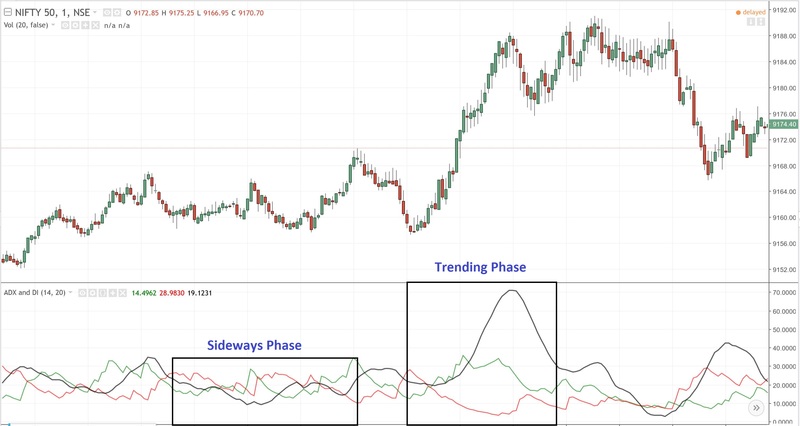 This indicator aids in determining the strength of ongoing trend, and when combined with two supplementary indicators (+DI & -DI) it also helps in interpreting the direction of trend. We would learn how to trade with the help of these 3 indicators and always stay with the trend in correct direction. There is a downloadable Excel sheet at the end of the post where you can download real time stock quotes with ADX values. Average Direction Index also known as ADX is a non-directional trend strength indicator. Its values oscillate between 0 to 100, higher the value higher is the strength of trend. The default look-back period off ADX to calculate trend strength is 14 periods, but various other periods are used depending on the relative volatility of stock or index. It is often used in conjunction with two other indicators, +DI and -DI which determines the direction of trend. ADX was developed in 1978 by J. Welles Wilder. ADX is normally plotted as a single line in a stock chart. Below is the price chart with ADX. Calculate the directional movement +DM1 and -DM1. Directional movement is positive when the current high minus the previous high is greater than the previous low minus the current low. This so-called Plus Directional Movement (+DM) then equals the current high minus the prior high, provided it is positive. A negative value would simply be entered as zero. Directional movement is negative (minus) when the previous low minus the current low is greater than the current high minus the previous high. This so-called Minus Directional Movement (-DM) equals the prior low minus the current low, provided it is positive. A negative value would simply be entered as zero. Calculate 14 period moving average of True range (TR14). Here the period 14 corresponds to the ADX period 14. Calculate 14 period moving average of +DM1 and -DM1. It would be called +DM14 and -DM14. +DI14 is the ratio of +DM14 and TR14 expressed in % terms. -DI14 is the ratio of -DM14 and TR14 expressed in % terms. Calculate Directional Movement Index (DX). It equals the absolute value of +DI14 minus -DI14 divided by the sum of +DI14 and – DI14. It is also expressed in % terms. Calculate Average directional index (ADX). It is the 14 period moving average of DX. Finally, don’t worry about the complex nature of these calculations as we have everything covered in the excel sheet which can be downloaded from the end of this post. You can use ADX with other Trend following systems to avoid whipsaws during sideways market. In general, ADX is used in conjunction with +DI and -DI indicators which also helps in determining the direction of trend. If +DI value is greater than -DI then it indicates bullishness, and if +DI value is less than -DI then it indicates bearishness. Crossovers of DI lines can further help in timing the trades. This is an semi-automated Excel sheet which updates by itself on a single click. You would just need to enter the stock name, exchange and timeframe and the Excel sheet would do the job for you. Apart from calculating the ADX and DI values, this excel sheet also indicates Trend strength and direction. ADX value below 30 is interpreted as weak trend, while ADX value above 30 is interpreted as strong trend. The direction of the trend is calculated based on +DI and -DI values. Step 4: Click on Get Data button. The data would be automatically downloaded and ADX values would be caluclated. This data can be downloaded for max 15 days and the minimum interval is 1 minute. Please see the below link to download ADX Trend strength indicator excel Sheet. Please let us know if you have any feedback or comments. How to Calculate TWAP and use it for Trading? We meant that it should be minimum 150 periods. 1 Day has close to 400 periods in 1 minute timeframe. This Excel sheet is only for Intraday timeframe. We would create another one for daily TF. Admin Sir , this excel sheet can used in commodity trading? Yes ADX can be used for commodity trading, but currently MCX exchange is not supported in the excel sheet. the exel sheet it’s realy helpful..
is adx values changed automatically intraday like “OHL Strategy” excel sheet.. or we want refresh .. In this Excel sheet, you would need to manually refresh the values by clicking on ‘Get Data’ button. Request you to please share “Supertrend scanner” based on EOD on excel sheet (automatically update) so that we can see active buying in filtered stock list and select stocks for further trading. May I know how to modify it to support Hong Kong stock? Thank you! Try entering Stock Symbol and Exchange Code in the space provided in Excel sheet. I have tried it but failed. For example, Symbol: 5 and Exchange: HKG. Thank you! timeStamp value is 0 and it failed at here. Thank you! Since HKG stocks return format has another additional row “DATA_SESSIONS”, hence the program need to adjust a little bit to support HKG stocks. I have tried and it works, but it would be better to letter author to confirm. Thank you! Can you help with the list of Symbols to be used in the ADX sheet. Thank you! You can input any symbol traded in the respective exchange. Hi. This is a great indicators of trend . As you mentioned this is for intraday. Question 1. Are the time period used are 1 minute interval. Question 2. Has this strategy been back tested, if yes then could you please publish results. You have to input time period in the Excel sheet (See interval input). No, this strategy has not been backtested yet, but I have used it along with some trend following systems and it works well. Sir, The sheet has stopped updating today 14th Sep 2017. I think the Google URL might have changed. Kindly teach me how to fix this. Google recently stopped providing API access to the live data. We are looking for alternate free methods to update this sheet. Hi Sir, I changed the url in the macro to https://finance.google.com/finance/getprices? now it seems to be working fine so far. Hi NITESH in this link https://finance.google.com/finance/getprices? didn’t work for me can u guide how? Now, just close the macro page and save the excel sheet. it should work fine now. Thanks a ton for this correction! You saved us a lot of time. I have updated the sheet in the post. Sir, pls send me all the excel for investment horizon of short term as well as long term and of course intraday too. 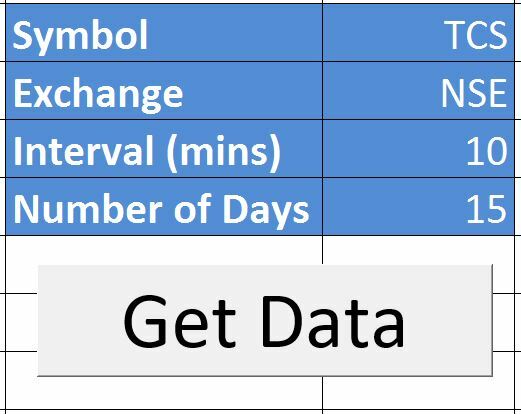 It seems, that the formula is derived from the stockcharts, I downloaded the excel sheet, but getting wrong data, for example take hdil, I am getting different values with 14 day period than in live data. Also may I know where you posted for daily ADX, I want to use it. Formula for ADX is universal everywhere. Values may vary slightly depending on the data accuracy and number of candles tested. This is great, but can you help. I’m having trouble pulling data from the London Stock Exchange. Is the symbol LSE? FTSE100? Its working at my end. Can you please re-check if you have enabled macros.